Everyone knows spinach is good for health. But, we do tend to avoid spinach in our diet. Especially kids try to avoid any spinach dish. This is a very simple dish and goes extremely well with sambar or rasam rice. I will post keera vada recipe soon which is very popular among kids. Cook toor dal with a pinch of turmeric and required amount of water. Soak spinach in a big bowl of cold water for 5 minutes. Trim off the stems and remove any slimy, blemished leaves. Wash them thoroughly in cold water and chop finely. Heat oil in a pan, add mustard seeds. When they start to splutter add onions. Fry them till they become slightly brown. Add red chillies, asafoetida, salt to taste and after few seconds add chopped spinach and mix well. Cover the pan and cook for about 5 to 7 minutes. 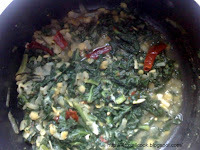 When the spinach is cooked add the cooked toor dal and mix well. Note: Be careful while adding salt for this dish. Even a little extra salt will spoil the dish. yes these were taken by me after preparing.